You are here: Abbeyrose Foundation / News & Announcements / February 2014 Tip – Teach your dog to do puppy push-ups! February 2014 Tip – Teach your dog to do puppy push-ups! The weather over the past several months has kept many of us indoors and we and our pets are getting cabin fever. The less mental and physical activity your dog has, the more mischief he tends to get into. To help counteract his boredom, consider teaching your dog some new activities that will exercise both his brain and his body. 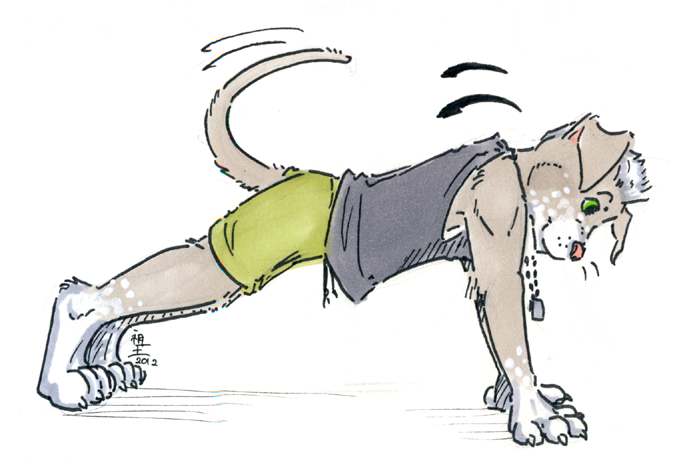 One activity I like is the puppy push-up. It is fun for you and your dog and helps to reinforce the bond between you. When your dog gets pushy for attention and won’t leave you alone, have him do a few push-ups. A push up is a sit, followed by a lie down, and then back to a sit, with this sequence repeated several times. March 2017 Tip – Puppy Pushups!